Hemophilia is a congenital genetic disorder a condition whereby patients lack particular proteins in plasma which make blood clotting possible. This means that patients suffering from hemophilia tend to bleed more in the case of an injury and it mostly affects the joints that facilitate movements like the knee and hip areas. The continuous bleeding in the joints causes a condition called hemarthrosis which makes the surrounding muscles lose their strength and their range of motion. The good news is that patients can now get aquatic therapy in CT to help them get back their normal mobility around their joints and to relieve the pain that comes with this condition. Since the introduction of aquatic therapy, patients can now get back their full mobility and get back to living a normal and healthy life. Through research, aquatic therapy has been proven to be more effective in helping patients with hemophilia than other exercises on land such as cycling, basketball and yoga. Water buoyancy helps the body to go in a relaxed state and while in water the heart rate and blood pressure decrease making the body more flexible. The patient is able to flex his joints to the maximum position and this helps with quick recovery in the process. One of the major benefits is It helps patients to reduce swelling and pain around the affected areas. A program is implemented where the patient goes for aquatic therapy once a week for like 30 to 45 min for the next 8 weeks. In the initial stages it is very hard since blood flow in the joints is minimal due to the swelling caused by injuries but as time goes by, water helps the patient’s blood flow allowing the patient to heal the damaged muscles. The improved blood flow is not just limited to affected area but the body as a whole which is beneficial to the general health of the patient. 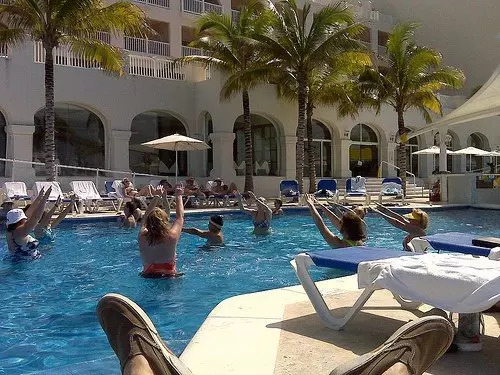 In a pool, a person can offload about 65% of his weight through the resistance of the water and this helps the patient to increase the function and strength of his muscles. In the process, some patients have confirmed that they were able to reduce their weight which helps them to keep fit. Aquatic therapy helps patients to strengthen their joint muscles and this increase the function of the knees. This helps to reduce bleeding into the joint area which in turn increases the range of motion. Aerobics help in improving the flexibility of knees and hips. As you engage in aquatic therapy, being in water relaxes your body muscles which in turn have a positive psychological outcome. It has been reported that it allows a person to relax in mind and body and this helps to fight depression in some instances enabling you to get a holistic experience.